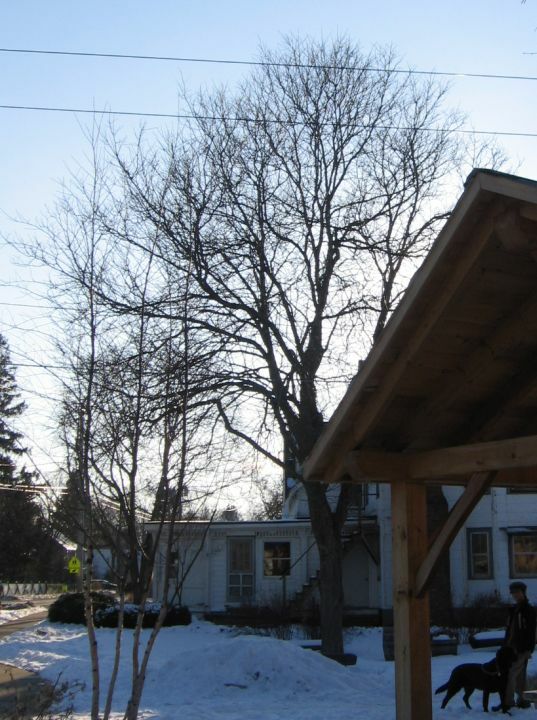 This big, multi-trunked veteran in the little green space in the farm parking area in front of the “old farmstore” is a Silver Maple (Acer saccharinum). A native tree of this region, it naturally grows in moist bottom-lands along slow-flowing, meandering streams where flood waters deposit fine sediment and standing water stays behind long after the stream has returned to its normal water level. 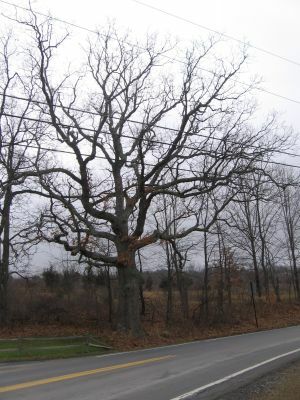 They very often are multi-trunked and real survivors, not easily discouraged by physical damage (such as the many broken branches on this specimen which were a result from the last ice storm). Silver Maples are also popular ornamental trees commonly found in front yards or even as park or street trees. 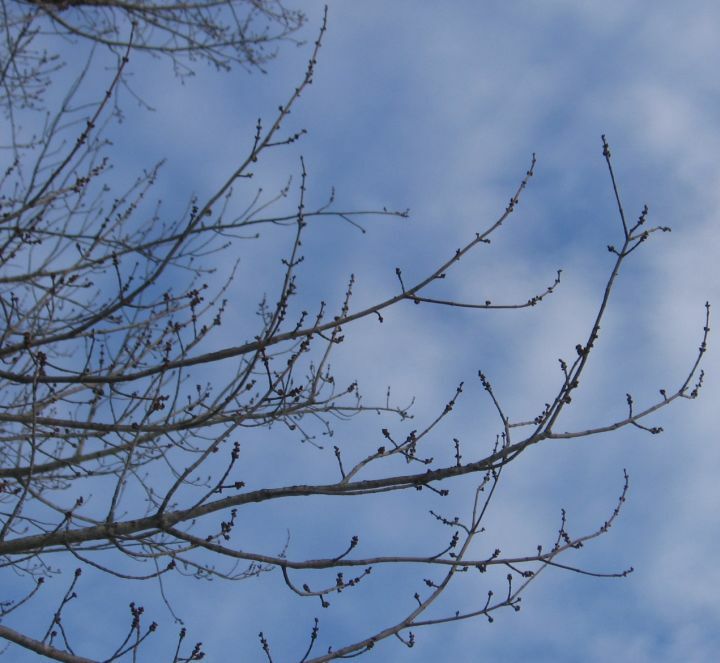 Silver Maple is very closely related to Red Maple (Acer rubrum), pictured below and has similar winter buds, but if you come back in the summer, you’ll see that the leaves are much more deeply lobed than any of our other native maples. This Red Maple (Acer rubrum) is one of the largest trees growing along the southern fence line of Harlemville Road and marks one of the cattle crossings. The Red or “Soft” Maple is a native species of tree that is not very picky about where it grows: often it is the dominant tree in swamps (look for the first trees to turn color in late summer in swampy areas! ), but it can also be quite common in certain upland forests. As illustrated by this particular specimen, Red Maples can also be found as single trees along roadsides and in fencerows. 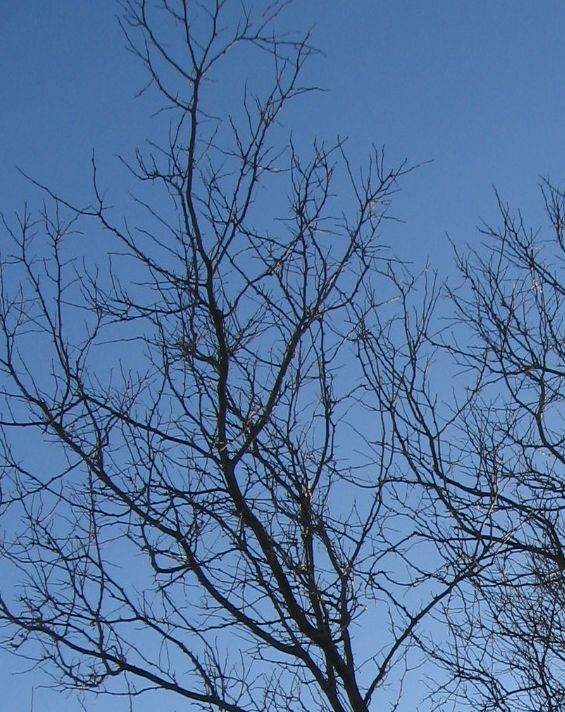 All maple species are characterized by an opposite branching pattern, which means that twigs emerge in opposing pairs from the same point along a branch. The alternative is an “alternating” branching pattern, where twigs tend to emerge one by one and grow on alternate sides along the branch. Sometimes, it is not as easy as one would think, to determine whether a tree’s branching pattern is opposite or alternate. One thing to remember is that not all twigs that begin to grow stay on the branch. Many are eaten or knocked off, leaving a scar visible on close inspection but not necessarily obvious from afar. However, if you patiently scan several branches from their tips towards the trunk of a tree, and both the smaller twigs as well as the stronger side branches are at least sometimes arranged in an opposite pattern, you might get the feeling that this tree really wants to be opposite, even if it doesn’t work out all the time… On top of that, both Red and Silver Maples have big round clusters of reddish buds which distinguish them from other maples, such as Sugar Maple (Acer saccharum) pictured below. 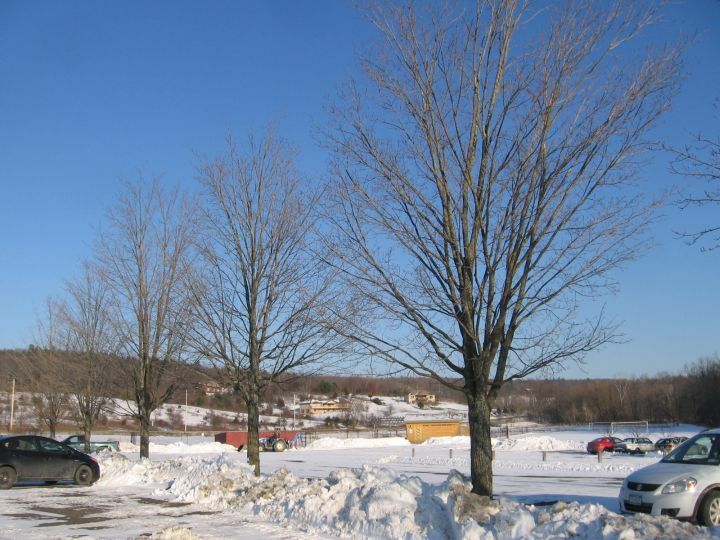 This row of trees in the parking lot of Hawthorne Valley School features native Sugar Maples (Acer saccharum), which have the opposite branching pattern of all maples, but inconspicuous, narrow, pointed buds. 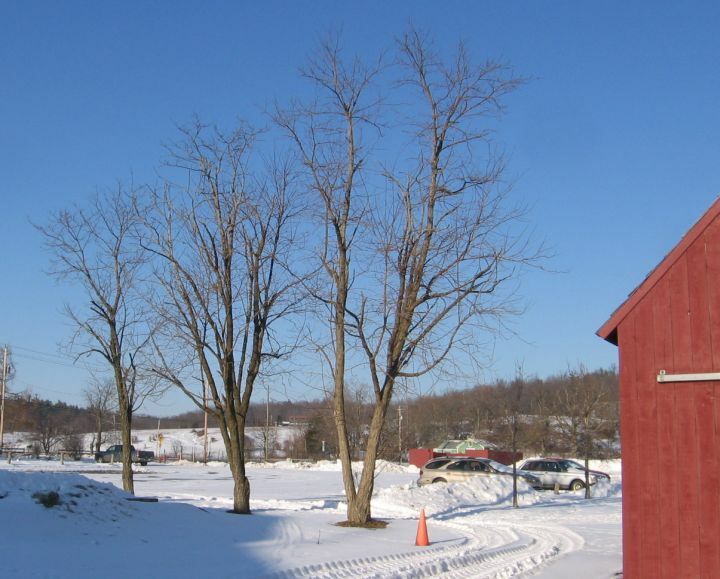 Sugar Maple grows naturally in fertile and moist forest soils and is the main source of maple sirup. Very similar, and often confused with Sugar Maple, is the introduced Norway Maple (Acer platanoides), which has begun to invade our forest here at the base of Phudd Hill. 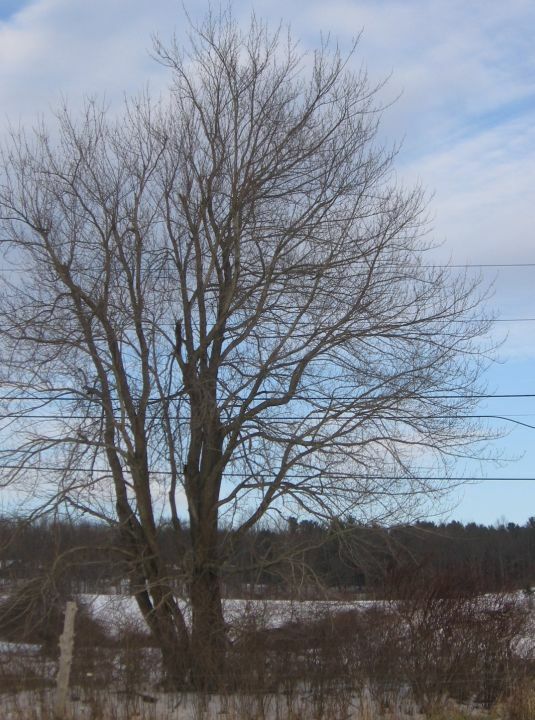 As far as we know, this is the only Norway Maple (Acer platanoides) in the hamlet. It tends to leaf out a bit earlier than the native maples and keep its leaves longer into the fall, eventually turning color, but mostly displaying yellow and orange and not so much red… Norway Maple is most closely related to Sugar Maple and has very similar leaves, but its buds are markedly larger and rounder than those of Sugar Maple, yet never as red and clustered as those of Silver and Red Maple. 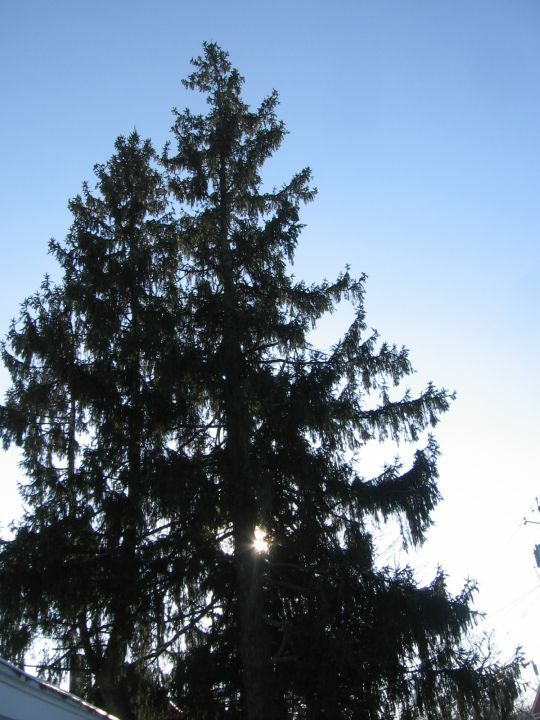 The towering evergreens next to the 1st and 2nd grade building of Hawthorne Valley School, are non-native Norway Spruce (Picea abies), recognizable by their drooping branches and, upon closer inspection, by short needles that emerge from the top and bottom, as well as the sides of each young twig. Most of the evergreens found wild growing in the forests around here are either Eastern Hemlock (Tsuga canadensis, common on the steep slopes of Phudd Hill, behind the school) or Eastern White Pine (Pinus strobus). Hemlock has short needles that emerge in two rows along both sides of young twigs, while White Pine has long needles that are arranged in clusters of 5. … and also in a fencerow on the pasture behind the Farm Store. This legume tree is originally from Southeastern North America, but has been widely planted and is now well established as a wild-growing species throughout Columbia County and seems particularly common on the forested hills around Philmont. It has also been introduced throughout Europe, Southern Africa and Asia. 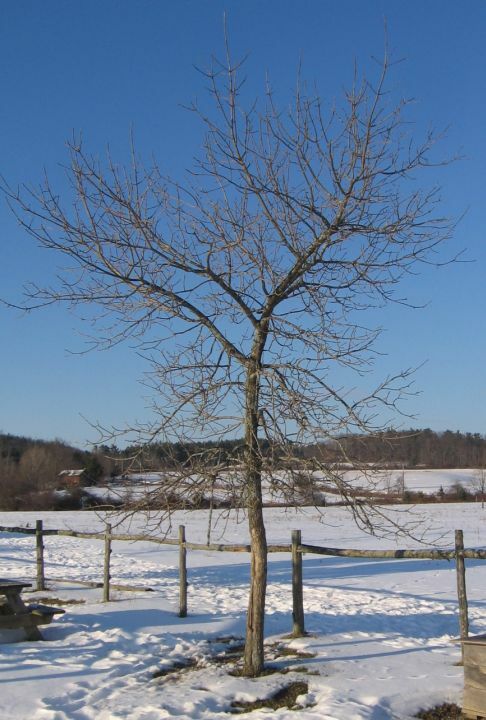 Black Locust is fast-growing and has hard and rot-resistant wood, which makes it a good choice for fence posts. 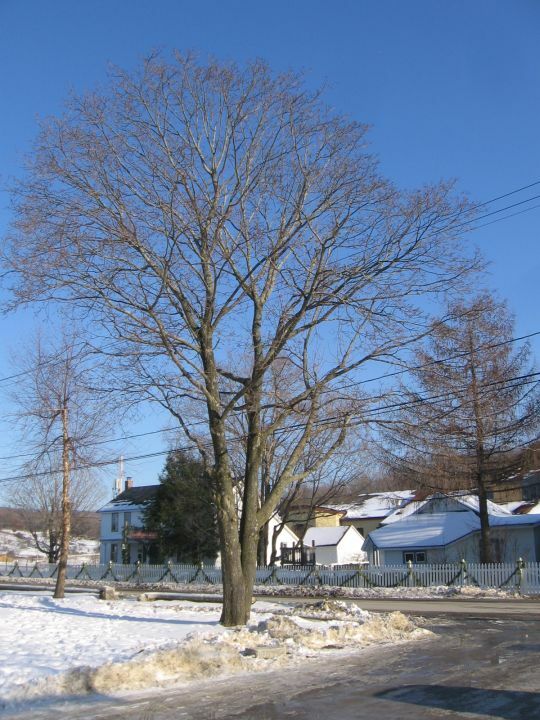 An easily recognized native tree that grows here and there around Hawthorne Valley is the Ash (Fraxinus sp. ), pictured below. An iconic tree well visible from the barn yard is the Shagbark Hickory (Carya ovata) growing along the farm creek. This native species is a common component of the Oak-Hickory Forest type throughout our County, and for some reason also is often found as a lone tree in the middle of a meadow or as a prominent tree in fencerows. 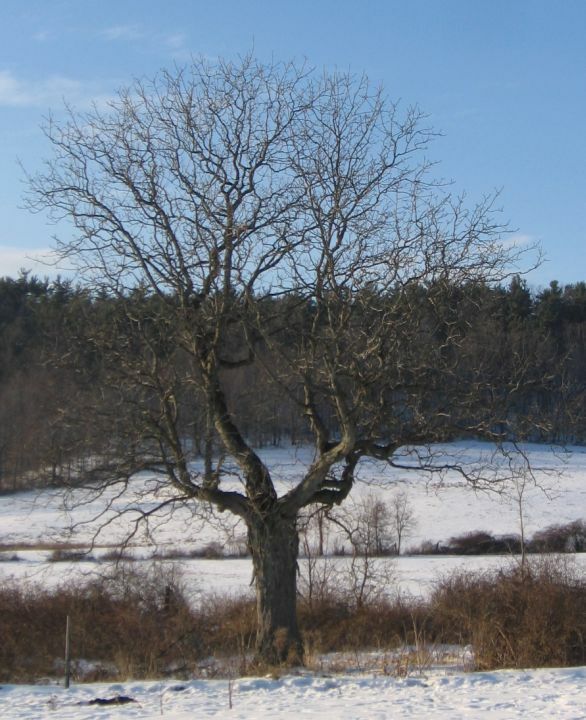 The fact that its seeds are collected and transported over large distances by squirrels may explain how a lone tree like this could get established. 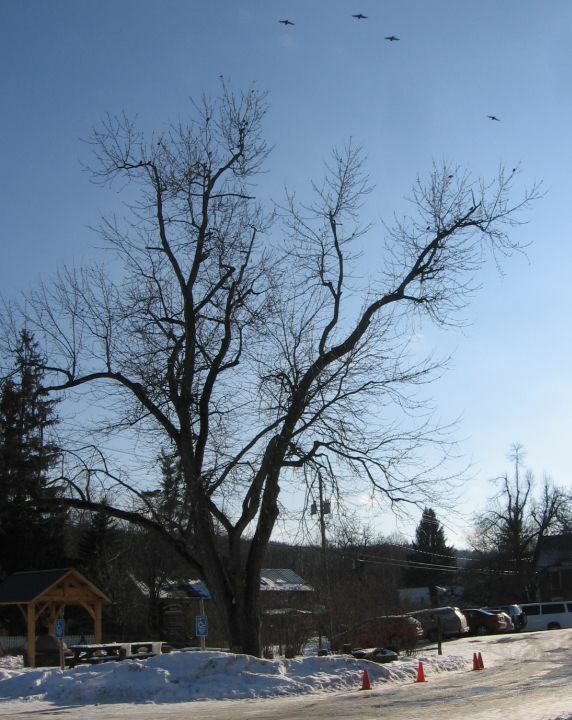 The bark that peels off in large, vertical strips, combined with the almost “curly” arrangement of the twigs in the crown makes this one of the easiest trees to recognize by its silhouette. It always strikes me how different the silhouette of a tree growing in the open is from another tree of the same species that grows in a forest. The open-grown tree branches much lower to the ground and has a crown that is proportionally much bigger. Oaks show this same pattern in open-grown vs. forest trees and have similar branches with a “curly” arrangement of twigs. 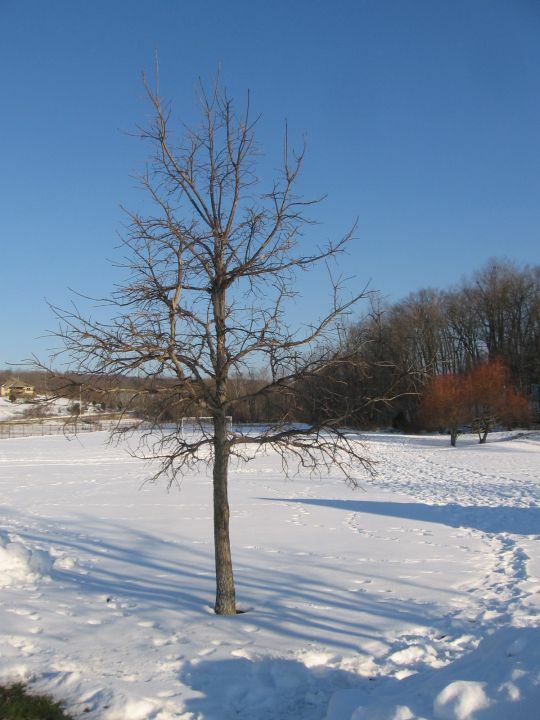 This is a gorgeous White Oak (Quercus alba) right next to the Old Schoolhouse on the intersection of Route 21C and Harlemville Road (picture taken Jan 13th, after the thaw…). 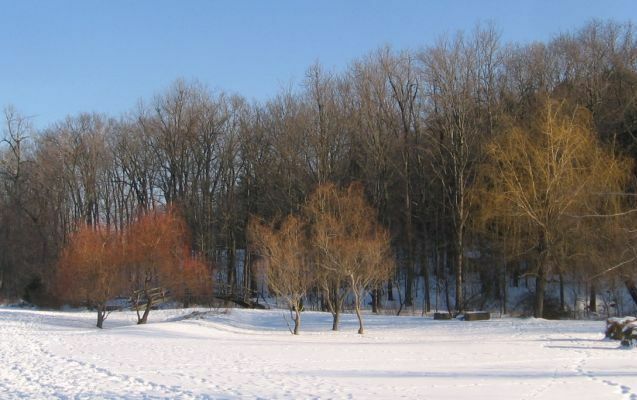 According to Gary Ocean, who planted them, the two groups on the left are varieties of Curly Willows (Salix matsudana “Scarlet Curls” on the far left and “Golden Curls” in the center). The willow on the right is a Weeping Willow (Salix babylonica). All of these willows are native to Northern China, but have a long history of cultivation throughout Europe and North America. 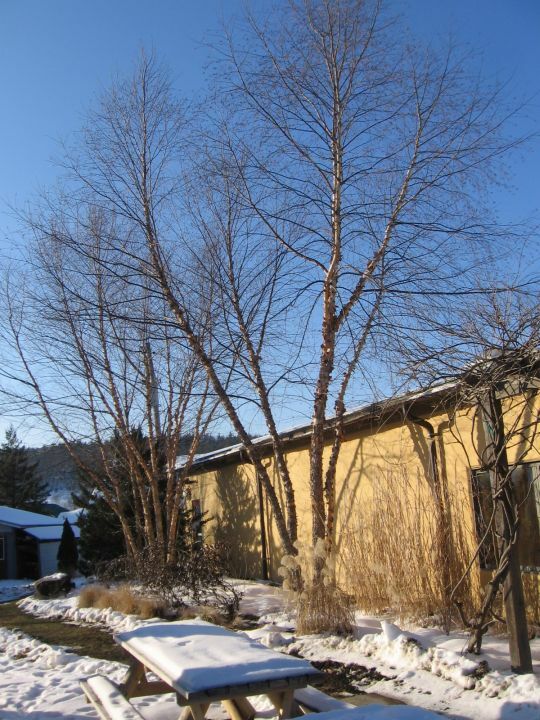 Gary Ocean also told me that all the graceful birches planted around the Farm Store are cultivated forms of the native River Birch (Betula nigra), which is easily recognized by its exfoliating, cinnamon-colored outer bark. In the wild, we have not yet seen this species in our county, but it has been reported to grow here and there along the Hudson River, just south of here. One of the more common native birches defines a beautiful spot in a pasture north of the hamlet. 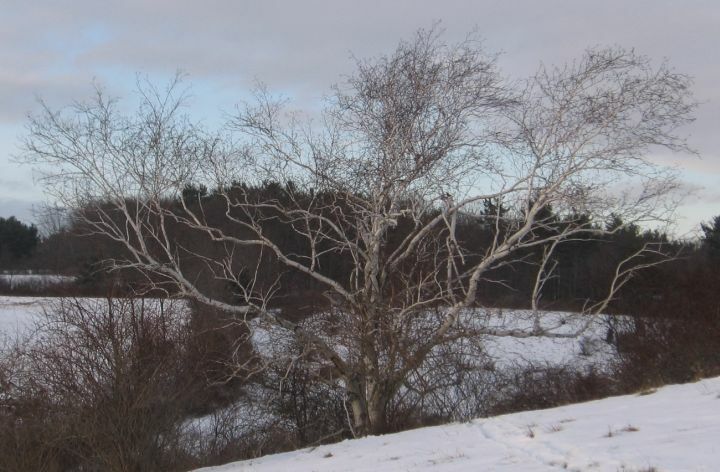 This lone Paper Birch (Betula papyrifera) in its exposed location has been shaped by wind and ice storms to grow low and broad, as if hugging the ground to avoid the extremes of weather, yet spreading its branches wide to define its place in the world.